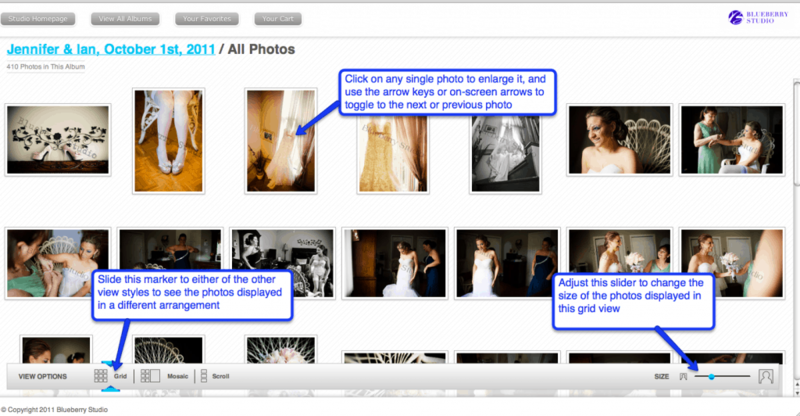 Navigating around ShootProof’s photo galleries should be a snap for even the least web savvy client. We’ve noticed that lots of our photographers don’t often view their galleries, so take a second to take a peek and that way you’ll know what your clients are seeing! Here are a few quick tips for optimal photo gallery browsing…taking those photos is only half the battle, showing them off is just as important! Click on the image to enlarge, and make sure to check out our demo photo gallery or your own! Images compliments of Blueberry Studio.